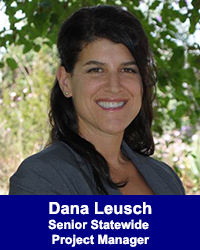 Dana Leusch - California Consulting, INC.
Dana Leusch, California Consulting Senior Statewide Project Manager, joined our team in 2012. Dana has more than 15 years of experience in grant writing for non-profit organizations and freelance writing and reporting for newspapers and magazines. As development coordinator for an organization in the Rocky Mountains serving at-risk youth, her successful grant writing and fundraising led to the creation of a home for at-risk and homeless adolescent girls, which has since housed hundreds of teens in need. Dana earned her Bachelor of Arts degree in history from the University of California, Santa Barbara, and a Master’s degree in women’s history from the University of Montana. She lives in Clovis with her husband and two children.